Southwest of Portland, the town of Newberg, Oregon and nearby Champoeg State Heritage Area are rich with history. Newberg houses the only presidential site in the Pacific Northwest - Herbert Hoover’s boyhood home. 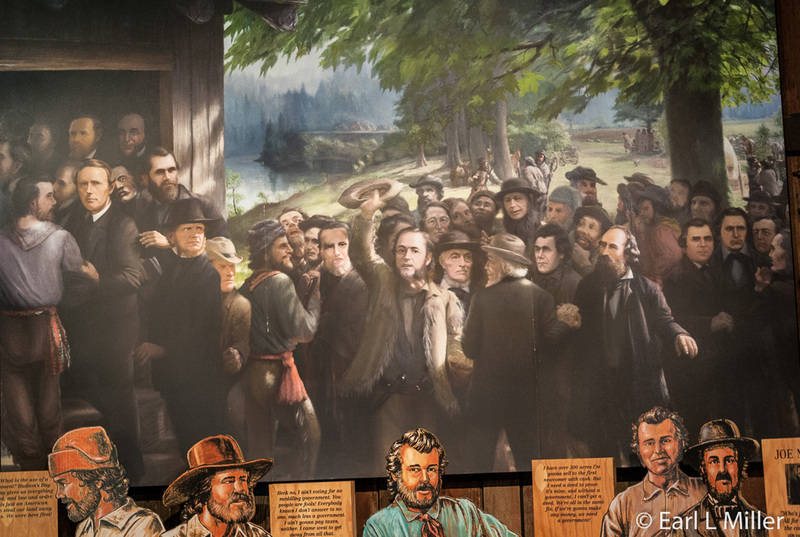 Champoeg marks the site of the birth of Oregon’s provisional government and the death of an active river town. Jesse Edwards, the Quaker founder of Newberg, platted the streets, and invited Quakers to form a settlement. 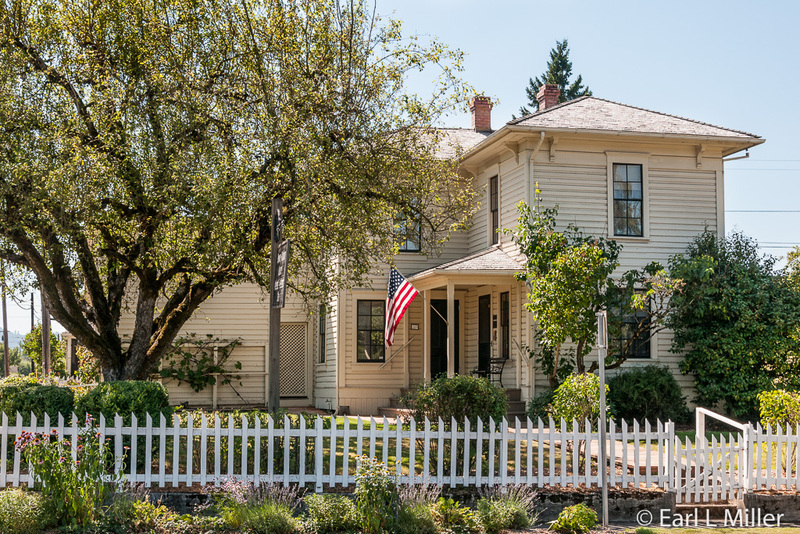 Originally on a farm which didn’t pan out, the Hoover-Minthorn home, built in 1881, is the oldest still standing house in the Newberg area. In 1885, Edwards asked Dr. Henry John Minthorn, Hoover’s uncle and foster father, to become the next superintendent of Friends Pacific Academy (now known as George Fox University). Minthorn accepted the invitation and moved with his wife and two daughters into the home. Another daughter was later born at that residence. Minthorn also worked as a doctor in rural Newberg. They lived there until 1888. Friends Pacific Academy later purchased the house. They sold it to the Herbert Hoover Foundation in 1947. Between 1947-1955, the Foundation restored the home and purchased the furnishings. A tour of the home provides insight into Hoover’s life as your guide relates his biography, and you see photos of Hoover on the home’s walls. 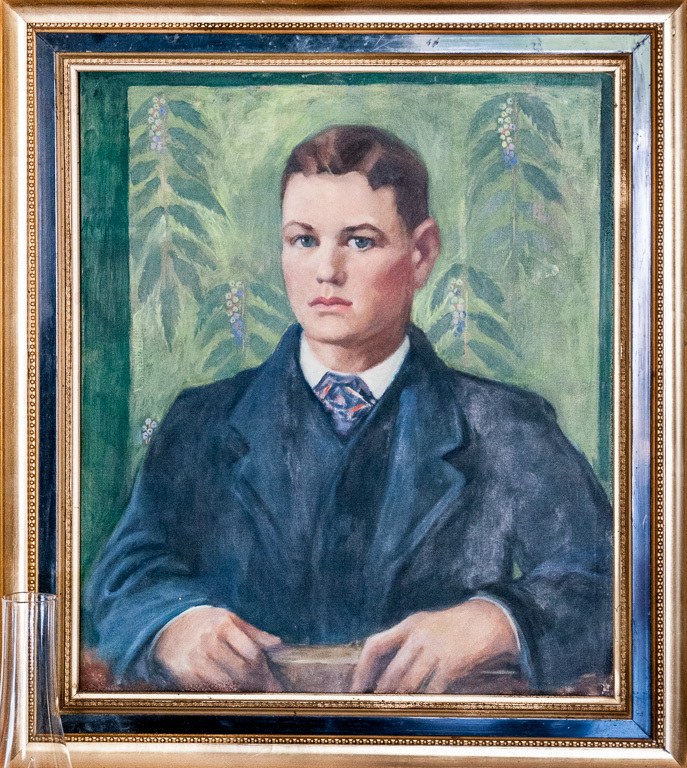 You’ll also see a painted portrait of Hoover in the dining room and one of Dr. Minthorn in the parlor. Herbert Hoover was born in West Branch, Iowa on August 10, 1874. He was six when he lost his father and nine when his mother died. He, his older brother, Theodore, and sister, Mary, were sent to live with relatives. Perhaps, because they had lost their son recently, the Minthorns sent for Herbert in 1885 to live with them. He lived in this home with the Minthorns for three years before the family moved to Salem in 1888. There Hoover was reunited with his brother and sister. In Salem, Hoover lived with the Minthorns for another three years where he worked as an office boy for his uncle’s Oregon Land Company. He decided on a mining career when he met a mining engineer in Salem and went to Stanford University where he was part of their first class. He was a mining engineer in Australia and China. He was in China during the Boxer Rebellion and organized the relief efforts for trapped foreigners. During World War I, while in England, he helped Americans who were stranded in Europe. He then headed the Commission for Relief in Belgium, helping to procure food for nine million Belgians. As head of the American Relief Administration, Hoover also helped post WWI Europe feed its people. Because of these efforts, President Warren G. Harding and Calvin Coolidge picked Hoover to become Secretary of Commerce. It was in this role that he spearheaded the construction of the St. Lawrence Seaway and the Hoover Dam. Hoover ran as a Republican in 1928 and won in a landslide against New York Governor Alfred E. Smith. He is the most recent cabinet secretary to be elected President and only one of two (along with William Howard Taft) elected without electoral experience or high military rank. He was defeated by Roosevelt in 1932. Hoover died in 1964. 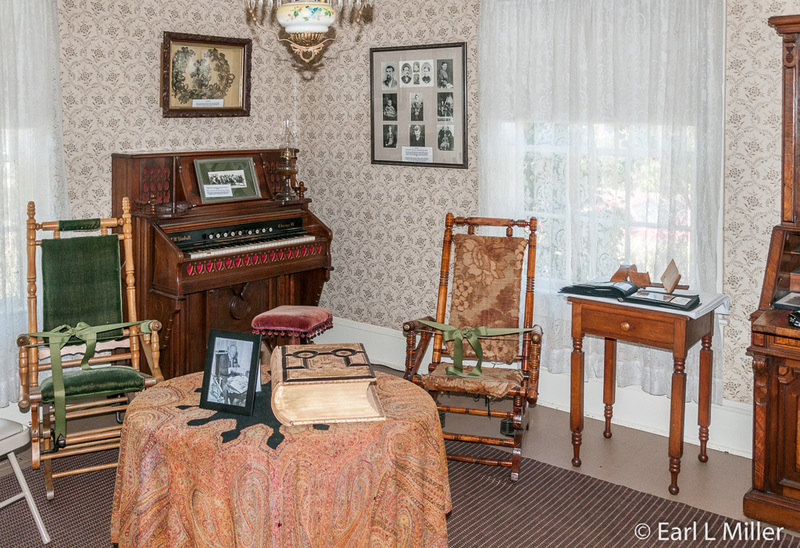 The home is interpreted as if it were the 1880s with most of the furnishings of the period rather than the family. Though this home has electricity, the original did not nor did it have running water or a telephone. It is still not air conditioned so it’s best to go on a cool day. It serves as a memorial to Herbert Hoover, Dr. Henry John Minthorn, and physicians in rural 19th century America. It is also representative of a typical Quaker home of the period. 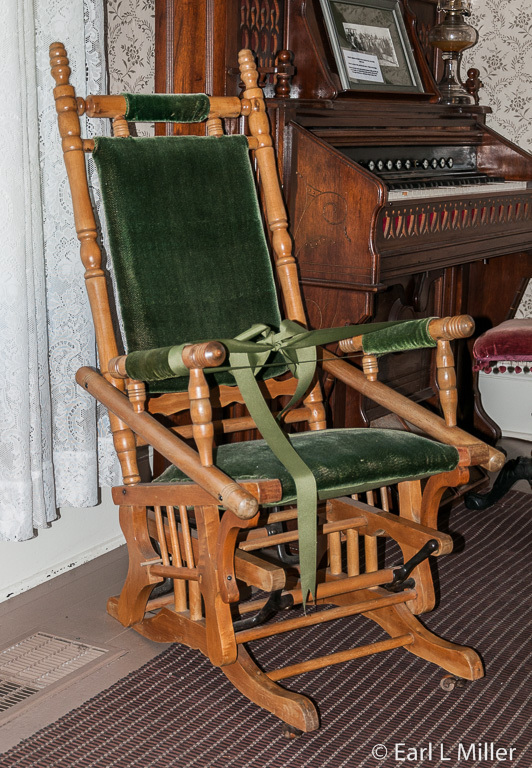 In the parlor, the two rocking chairs and some books belonged to the Minthorns. 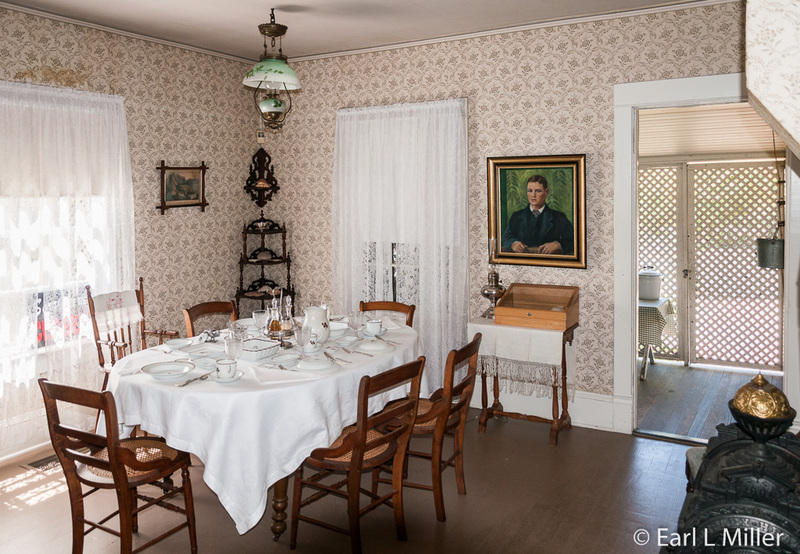 When Hoover came on August 10, 1955, on his 81st birthday, to dedicate the house as a museum, he said that was the first time he had ever sat in those chairs. That’s because children were not allowed in the parlor. They could only play in the dining room. A wedding photo of Hoover and his wife, Lou Henry, can be spotted on one of the dining room’s walls as can one of the home’s dedication. Some of the china in this room also belonged to the Minthorns. The kitchen was not an original part of the house. Instead, that area was the porch. The Kitchen Queen is original. 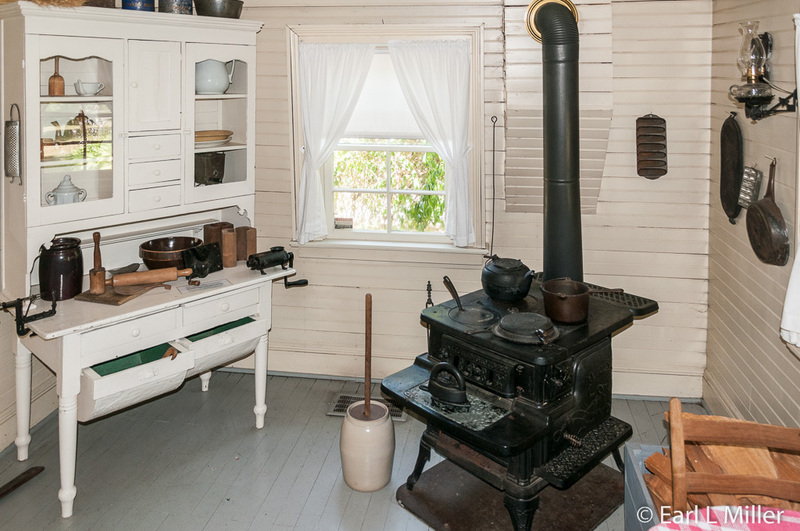 While the kitchen wood stove is not original, the one in the master bedroom is. In the woodshed, adjoining the kitchen, you’ll view two panels describing the Belgian relief effort with illustrations of flour sacks. These represent those from which the Belgians received their food during World War I. They embroidered these sacks with heritage messages and other designs. You’ll also see a wood chopping block signifying all the wood Hoover chopped as a child. 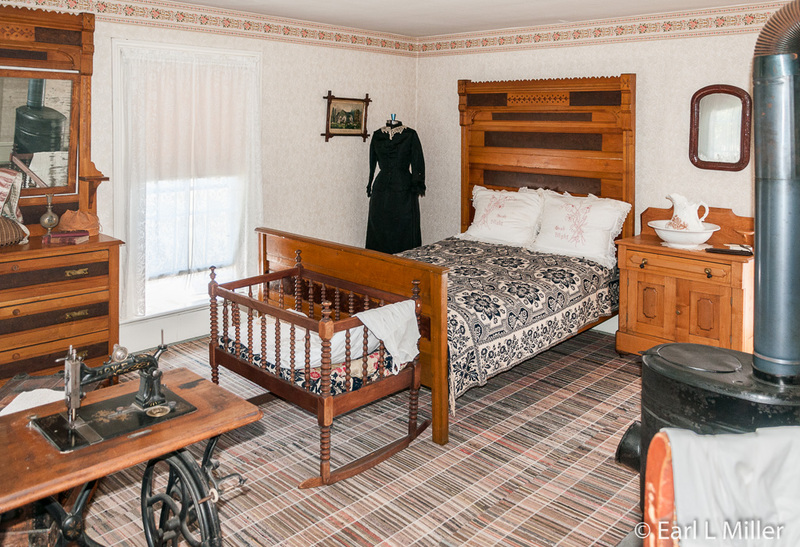 The three bedrooms upstairs are the master bedroom, the girls’ room, and Herbert Hoover’s bedroom. In the girls’ room you see their daughter Mary’s twin bed and porcelain doll. 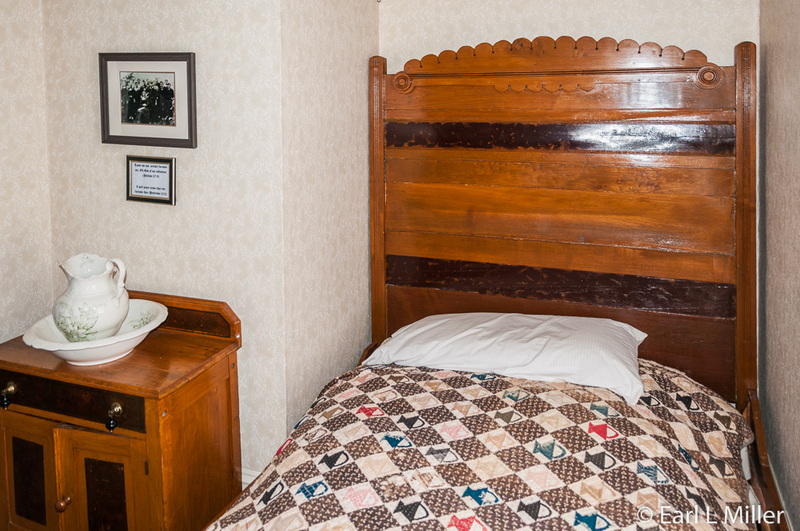 Hoover’s bedroom contains his set of furniture besides his fishing creel and fly fishing rod. The chest of drawers, bed, commode, and wash bowl with pitcher totally fill this small room. In that room, you’ll see a photo of his Sunday school class. In the hall, you’ll find a photo of him with his dog. The Hoover-Minthorn House Museum is located at 115 S. River Street in Newberg. The phone number is (503) 538-6629. Hours are Wednesday through Sunday from 1:00 p.m. to 4:00 p.m. from March to November. Admission is Adults $5; Seniors and Students $3; for children under age ten, it’s free. 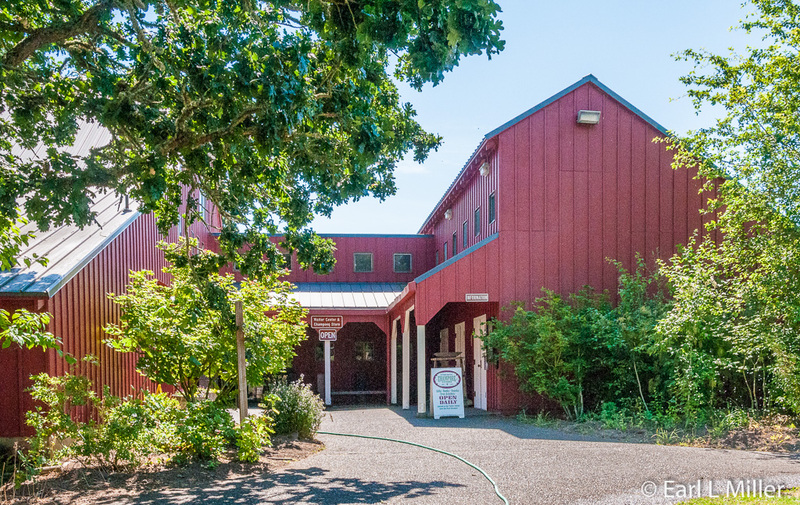 The Champoeg Visitor Center traces, through superb exhibits, the five cultures which dominated the Pacific Northwest. These were the American, British, and French Canadian fur traders; the Kalapuya Indians; and the settlers that made their way west starting in the early 1840's. I consider these displays far superior to anything I saw at the visitor centers at Crater Lake. The 15-minute video at Champoeg is also better. Start with the Kalapuya Indians, hunters and gatherers, who lived in the Willamette Village around 1600. The site of Champoeg was an important meeting place as there they could exchange goods with other tribes. Language could have been a problem, since different dialects were spoken, but communication wasn’t. An interactive concentrates on different words in the Chinuk Wawa language, which was spoken at Fort Vancouver and Grand Ronde. 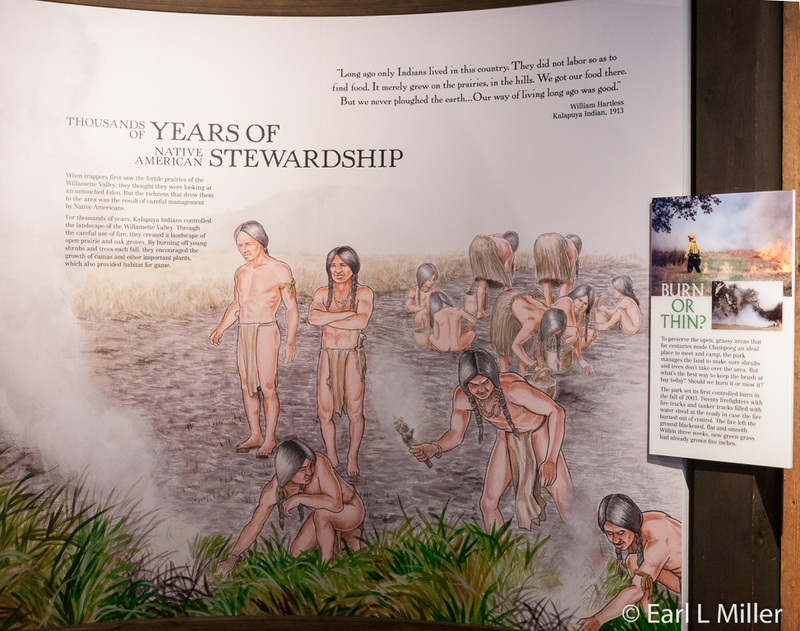 You’ll discover how important camas was for the Kalapuyas. They ground it with a mortar and pestle for food and also used it for trade. Take time when you visit to go outside to the heritage garden where you’ll see this plant. You’ll also learn using fire in forest management is not a modern tool. This tribe used it on a yearly basis which is why the land was so clear when the settlers arrived. Fire also herded the animals. Only in 1840, when the immigrants to the area stopped this practice, did the land start to become less manageable. 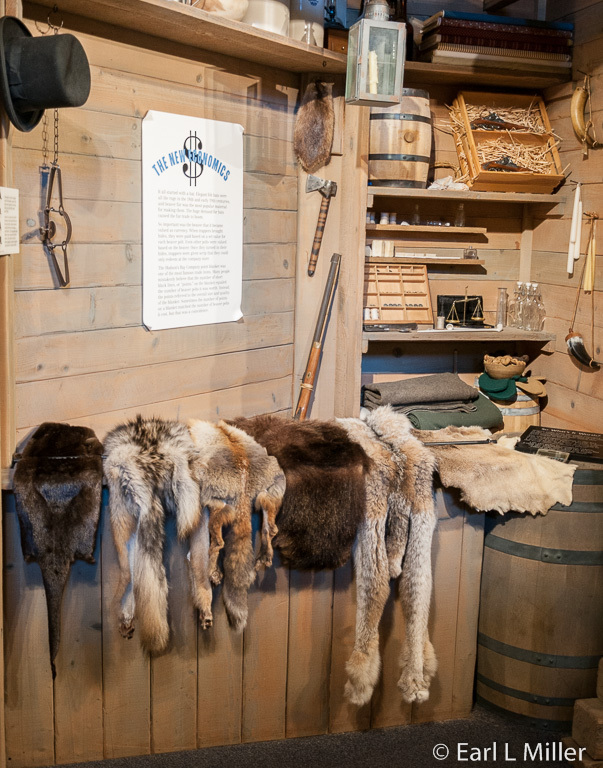 It was the fur trade that led to the Pacific Northwest’s development. The felt hat was a status symbol in Europe - particularly beaver felt hats. In 1811, Fort Astoria was the primary fur trading post of John Jacob Astor's Pacific Fur Company. With the War of 1812-1814, the Northwest Company bought out its assets in 1813 and renamed it Fort George. By 1821, the Hudson Bay Company took over the NWC, and Fort George was incorporated into its posts. The British continued to move east and set up Fort Vancouver. Champoeg was a meeting place for these trappers. It was the location of the Hudson Bay granary as well as the trading store where trappers brought their pelts to barter for goods. An interesting interactive has several actual pelts. You learn that not all were worth the same and that it took a certain number of pelts to purchase supplies. For example, two lynx or two fox pelts equaled one beaver pelt. It cost two beaver pelts to buy a man’s coat and four to buy a gallon of liquor. Many of these traders and trappers were French-Canadians who had Native American wives. The women knew how to find and prepare food, raise children, make clothes, and assist with the fur operation while moving from place to place. They served as translators and mediators between their husbands and their tribes. In 1856, all Indians in the Willamette Valley were forced onto the reservation at Grand Ronde. Officially, this included the Indian wives and their children. Many men moved with them. Men with those with wealth or power protected their families because of their status. Competition for control of the fur trade was a major factor in the British and the Americans resolving their disputed claims to the Oregon Country. The Hudson Bay wanted the boundary between the United States and Canada to be the Columbia River. The Americans wanted it to be north of there - the 49th parallel. By 1830, the fur trade had collapsed. Americans started to flood the valley. The Governor of the Hudson Bay, George Sinclair, was against this, as he wanted the area to remain British and an outpost free from competition. In the early 1840's, these settlers included missionary groups such as Jason Lee’s, whom McLoughlin encouraged to come. Trappers such as Robert Newell and Joe Meek, both fur traders, also settled into the area. The Hudson Bay Company’s Chief Factor, John McLoughlin gave to many of these groups seed to start growing wheat and extended credit to them. The excess crops were to be sold back to the Hudson Bay Company. Unfortunately, going against Simpson’s wishes cost McLoughlin his job. The area was called the French Prairie because many who settled there spoke French. Champoeg, at its northern end, was the primary shipping point as it was on the river. On May 2, 1843, about 102 men, who lived in the valley, met outside the Hudson Bay Company’s granary and trade store. Officially, they were meeting for a “wolf meeting” to discuss what to do with predators - wolves, grizzlies, and mountain lions. But unofficially, they were there for another purpose. After much debate, Meek called for a vote instead to form the Provisional Government of Oregon with Champoeg as capitol. The original vote was 50-50. Then two French Canadians changed their mind, Étienne Lucier and François X. Matthieu, and it passed 52-48. Champoeg was Newell’s town. He owned half of the land, was involved in many of the businesses, platted it, and constantly promoted it. He built a house on the bluff high above the rest of the town. 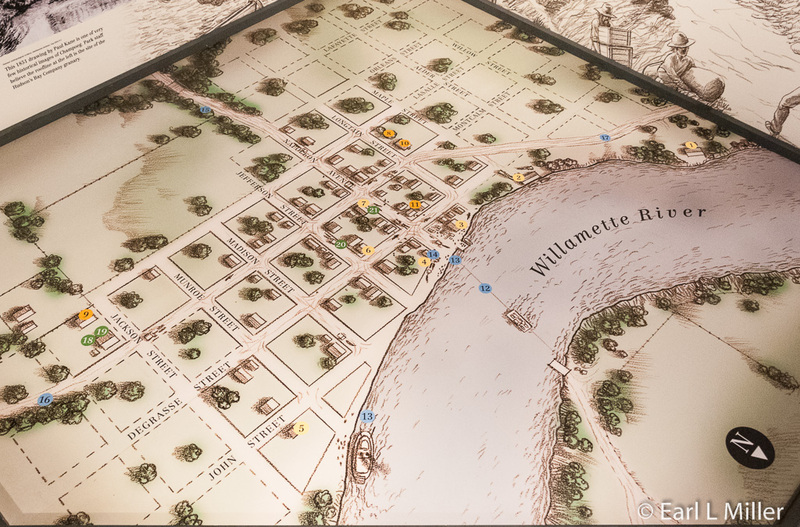 Champoeg became French Prairie’s thriving river shipping town of 200 people on the Willamette River. It had 60 houses, churches, stores, a hotel, saloons, a Masonic Lodge, and a bowling area. It also had a blacksmith, livery, stables, and a school. All the buildings were wood, either sawed boards or log. Even the foundations were made of wood. When you visit, take time to explore the huge diorama of the town. Toward the end of November 1861, a huge weather system stretched from California to Washington, bringing 18 straight days of rain to the Willamette Valley. When the water crested on December 6, it was as much as 30 feet deep on the Champoeg bottomland. When the water was gone, the residents found the entire town had floated away. No one from the town was killed but a few on the river’s islands weren’t as fortunate. Also, about one third of Oregon’s cattle were destroyed. In a few years, immigrants started to rebuild. But in 1891, another flood permanently ended the town. The Willamette has had major floods every 30 years since with the most recent in 1964 and 1996. Area dams were built in the 1950's and 1960's. Although they have eliminated the smaller floods, they can’t totally stop the floods entirely. 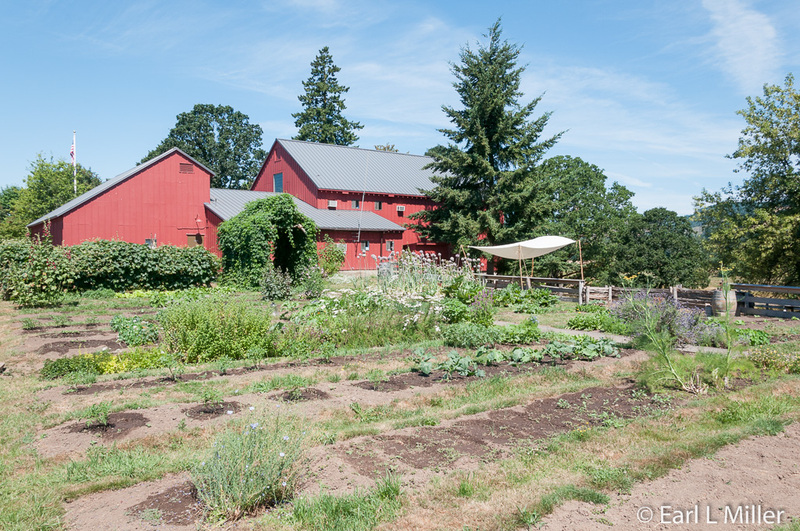 Unfortunately, no detailed descriptions or drawings still exist of Champoeg. The two known photographs only show the town’s children clustered around the school’s door. Some material did not float away and archeologists have found and catalogued 50,000 fragments of dishes, bottles, clay pipes, buttons, nails, etc. There is also evidence of Newell’s first cabin’s brick chimney and oven. His second home was high on the hill and served as shelter to many residents after the flood. It has been reconstructed and can be seen today at Champoeg. It’s run by the D.A.R. 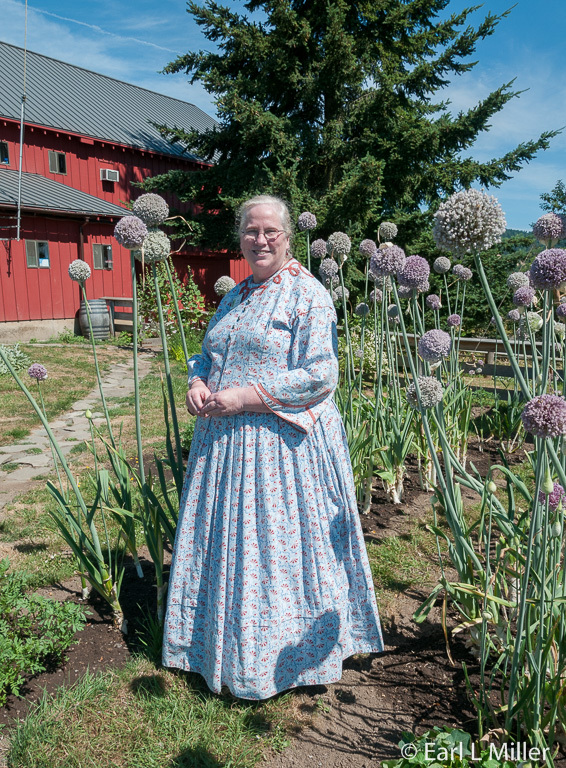 Behind the visitors center, you’ll find an example of an 1860's kitchen garden. Donald Manson, a retired Hudson Bay Company employee, and his wife, Felicity, lost the home they had lived in since 1857 in the Great Flood. 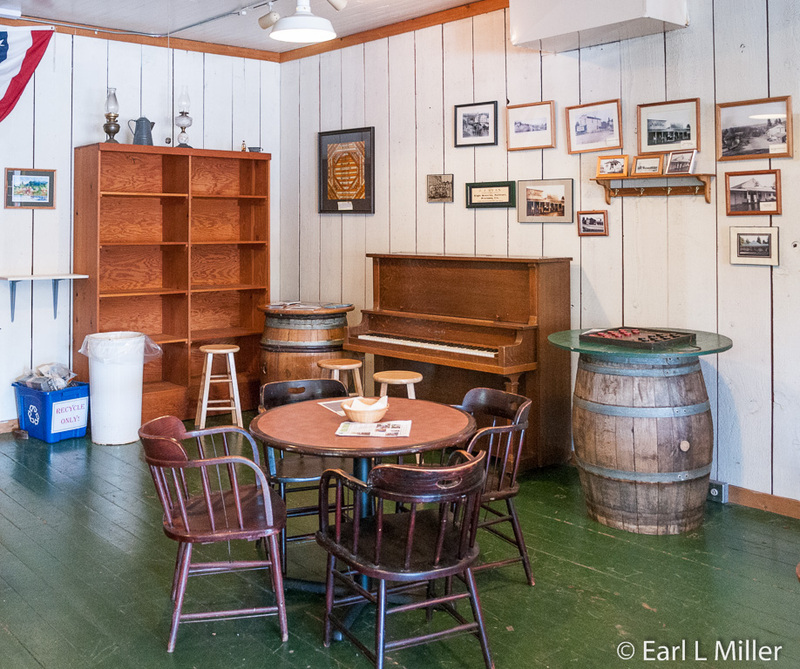 They moved to a home in 1862-63 located where the visitor center is now. The home burned down in 1931. Research shows they would have had such a garden. It’s planted with heritage varieties of vegetables, herbs, and flowers. You’ll find Salsify, Yellow Eckendorf, Mangle, Wurtzel Beets, Cardoon, Cupids Dart, and Shoo-fly. The fence is painted with authentic “white wash” instead of modern paint. Garden trellis structures are all hand-built from locally harvested young trees. You’ll also find an apple orchard. You can tour the garden on your own. Another option is to join a ranger-led tour held every Wednesday and Saturday at 1:00 p.m. from July 4 – Labor Day. The barn near the garden did belong to the Mansons. 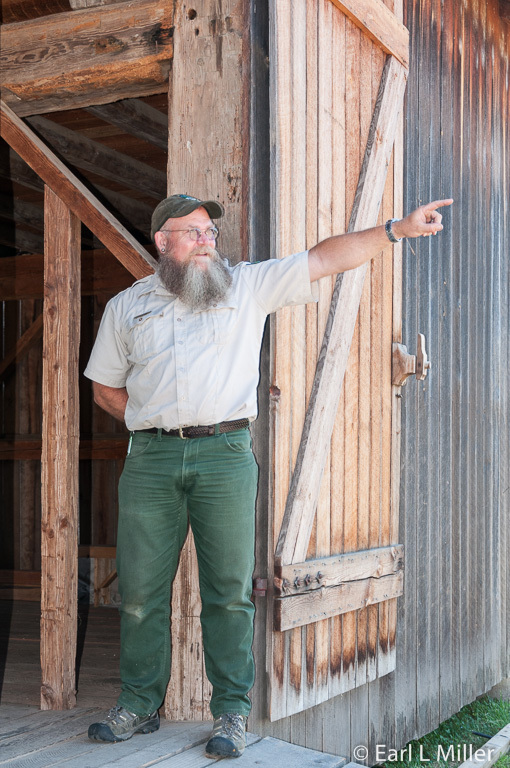 It’s one of Oregon’s oldest barns and is built out of recycled timbers. Originally, it was designed for the harvesting and storing of wheat. It later housed cattle and eventually sheep. It is the only remaining “side-entry wheat barn with threshing” floor in the state. It is believed because of its construction that Manson salvaged an existing building from the flood’s wreckage. For example, the supporting timbers are too large. Posts (the upright timbers) are 12 inches by 12 inches instead of the usual 10 by 10. Most of the beams (horizontal timbers) are also 12 by 12 rather than 8 x 10. Builders in the 1860's had learned smaller sizes saved money and worked as well. Also, the doors in the center of the side walls were originally elsewhere in the barn. 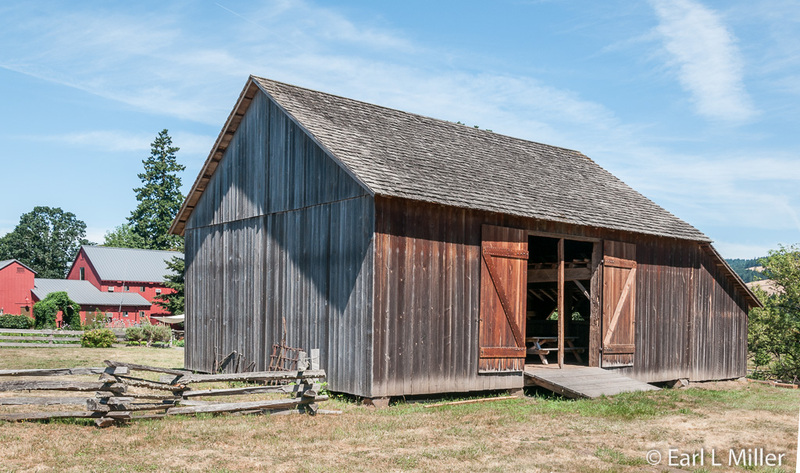 You’ll find Champoeg State Historic Area off of US 99W, 7 miles East of Newberg at St. Paul. Its address is 7679 Champoeg Road NE. Its phone number is (503) 678-1251. Visitor center hours are Monday through Friday 8:00 a.m. to 5:00 p.m. The park entrance fee is five dollars. 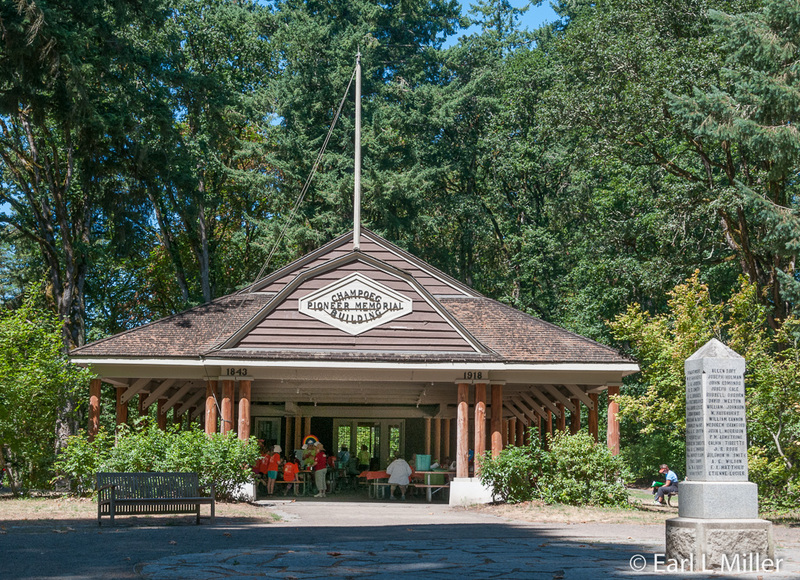 Another park site is home to the Pioneer Memorial Building Pavilion and Monument. Its restored plaza commemorates the 1843 vote and is where the Hudson Bay granary once stood before it burned down. The monument, erected in 1901, records those who voted “yes.” Francois X. Matthieu, the last survivor of the vote of 1843, attended its dedication. 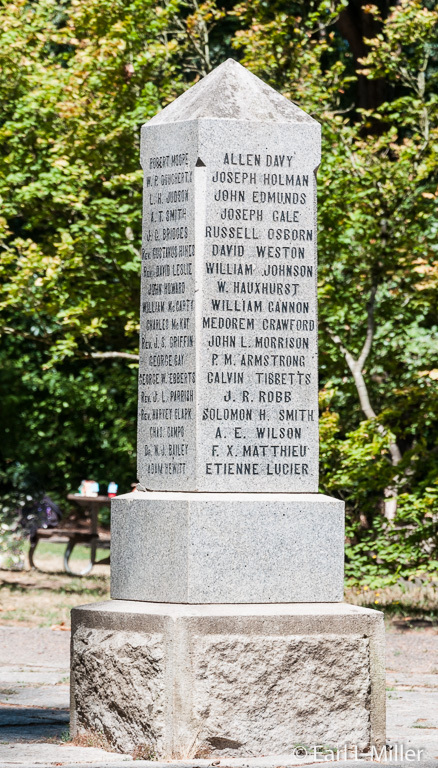 The Pioneer Memorial was built in 1918. 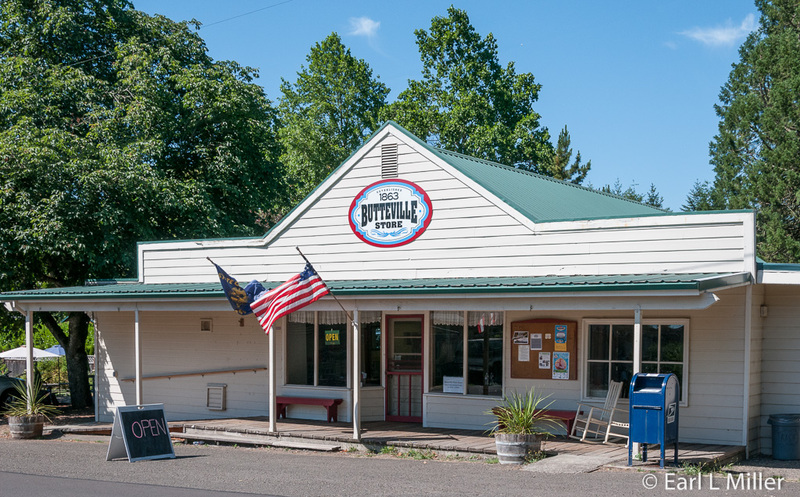 Drive outside the park to the nearby town of Butteville to visit the Historic Butteville Store, Oregon’s a longest continual operating store. 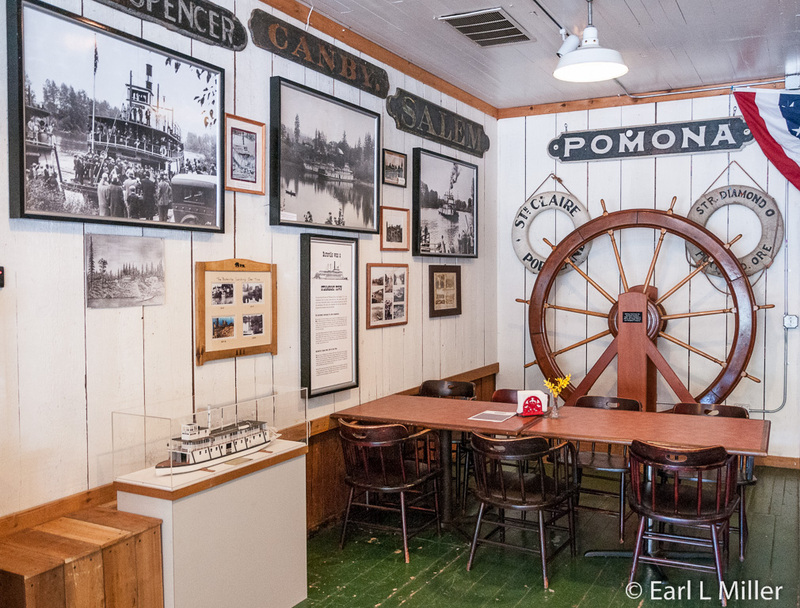 Established in 1863 as a mercantile store by Josie Ryan, it now sells snacks including ice cream. Check out the wall display on steamboats while you are at the store. Considered part of Champoeg State Heritage Area, it’s open June 5 to August 30, 2015, Friday through Sunday, from 10:30 a.m. to 6:00 p.m.